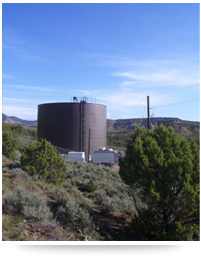 The summertime heat in the Colorado desert was taking a toll on the City of Rifle’s water tanks. Intense temperatures were creating thermal stratification inside tanks – promoting rapid disinfectant loss while accelerating biofilm and biological growth. To break these stratified layers of water, Rifle installed a solar-powered PAX Water Mixer. Configured to operate for eight hours per day, the mixer was able to completely blend the water and deliver residual throughout the tank. Summertime temperature stratification was eliminated and Rifle operators watched the summer pass by without a single water quality incident. Since then, Rifle has maintained their ultimate goal of delivering better water quality to customers while saving an estimated 2.6 million gallons of water annually.